The following bookstore makes for another addition to an area of South-Eastern Europe already rich in bookstores with English titles on stock - Romania, namely Bucharest. Operating for around 15 years, Okian is a Brasov based bookstore (these being their main premises), although they do have another location in the country's capital (opened in 2008). 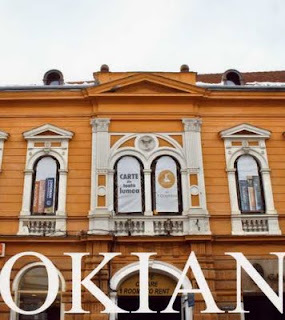 The Brasov based Okian can be found in the historical part of the town, in an old, sophisticated building, reconstructed for the bookstore's needs: large spacious rooms for various conferences, cultural activities, reading corners and even galleries where regular exhibitions are held. Among the bookstore's large stock of some 6000 books (out of which one third is in the English language), various categories of books can be found. These are mainly psychology, law, marketing and management, biographies as well as books on various school subjects such as physics, chemistry or geography. Okian has been the exclusive distributor of Pearson Longman ELT in Romania, thus it isn't a surprise that many of Longman's publications can be found within their walls. Thus, Okian makes a perfect resource for those who want to study English. However, the scope of this bookstore reaches way past quality study materials for the students of English, as Okian is generally considered as a great option whether you're looking for non-fiction academic titles or you feel like browsing through a selection of British and American fiction literature. What's more, if Okian doesn't have a book that you need in their stock, they are most likely going to be able to order it for you via their on-demand service. Okian is truly a great mixture of a local bookstore, an art gallery and a cultural institution which is definitely greatly appreciated by the growing number of expats in Romania but also by all the locals, as it grants them unrestricted access to English language titles.